Description: This colonial sea anemone has polyps up to 20mm tall by 10mm in diameter, arising from a thin, narrow basal band which adheres to rock or shells. Each polyp has a serrated parapet at the top of the column and 24-32 long, translucent white tentacles, each with a tiny white tip. The body and tentacles are semi-translucent buff or pinkish. The column walls and basal band may be encrusted with sand. Polyps contract at slightest disturbance. Habitat: Found on rocks and shells, in habitats subject to moderate tidal streams and some sediment scour. Sometimes forms extensive networks, occasionally with wide expansions of basal band with closely clustered polyps, from about low water mark to 100m. 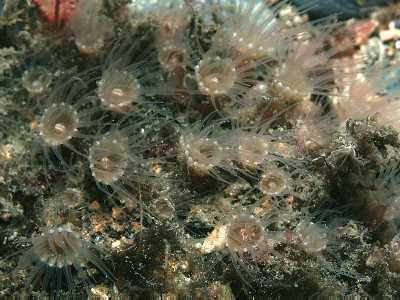 The colony may become overgrown by other encrusting organisms, being almost invisible unless polyps are expanded. Distribution: Occurs on all coasts of Britain and Ireland but rare in the North Sea. Common in some localities but easily overlooked. Elsewhere occurs southwards at least to the Bay of Biscay. Similar Species: The polyps probably resemble those of Epizoanthus incrustans but this can be distinguished by its different growth form. Colonial habit, polys usually arising from a narrow basal band. 24-32 tentacles, transparent with white tip (very conspicuous). Picton, B.E. & Morrow, C.C. (2016). Epizoanthus couchii (Johnston, in Couch, 1844). [In] Encyclopedia of Marine Life of Britain and Ireland.